The RoboGene® HCV RNA Quantification Kit 3.0 is CE-IvD validated for quantification of Hepatitis C Virus RNA in human plasma or serum samples using One-Step real-time PCR. The universal kit setup provided as an open system allows flexible and reliable application to most major Real-Time PCR platforms current on the market. The Internal Control is provided as an IC Spiking Tube for convenient handling with manual as well as automated extraction methods. Additionally, the Internal Control can be measured in VIC as well as Cy5 channel. Due to determination of target in FAM channel and when measuring Internal Control in Cy5 channel color compensation is negligible. Benefit from superior sensitivity and specificity and count on defined lyophilized standards covering concentrations from 2 to 7 log IU/ml for precise data acquisition. Three kit sizes, all including 4x4 standards, are available in order to provide the perfect solutions from low to high throughput laboratories. 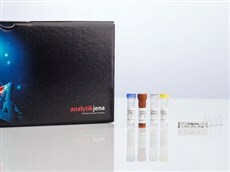 There are no threads in Analytik Jena RoboGene® HCV RNA Quantification Kit 3.0 Reviews at this time.